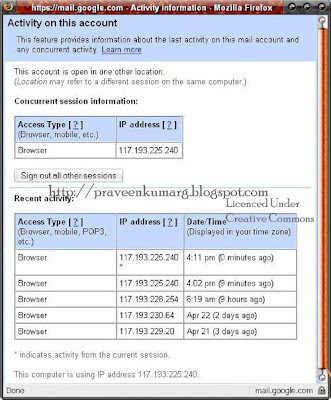 How To Check Whether My Orkut/Gmail Account Hacked ? You are here: Home / Security / How To Check Whether My Orkut/Gmail Account Hacked ? Many of us have doubt whether our Orkut/Gmail Account is Safe or Not.If you notice something unusual in your Orkut or Gmail Account.First and foremost step you would have to do is Check your Pc for Spyware/Trojan Infection.To do this use a good Spyware Scanner say Spybot Serach and Destroy or Spyware Doctor.If you find any infection remove it.The next Step you have to do is Changing your Password and all Other Account details(Secret Question,Pincode etc). Google makes it possible for you to see a history of who logged into your account, there Ip Address,Access Type(Say Browser,Mobile,Pop3 etc) along with Date & Time. If someone else were also logging in to my account, I’d be able to see it here on this screen and then could map backwards with IP address (Google “reverse IP lookup” to find some tools to help with that). You should be able to get a better sense of whether someone really is logging in to your Gmail account or not. Good luck! Suppose If your Account is Hacked and your are not able to Login Click here to retrive it. Hi Praveen, Nice Blog Mate, and this is an Interesting Post, anyways if you are interested in Exchanging link with me, let me know..